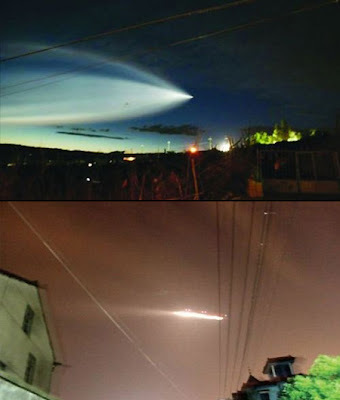 A UFO sighting last night at around 9pm in China diverted "dozens of inbound flights to nearby Xiaoshan Airport." Eyewitnesses "reported seeing a comet-like fireball in the sky and a number of local residents took photos of the strange ball of light." A local bus driver, giving his name only as Yu, said he had seen a strange glowing object in the sky late on Wednesday afternoon. 'The thing suddenly ran westwards fast, like it was escaping from something,' he said.